There aren’t many words that can accurately describe the grandeur of Banff, located in the Canadian Rockies. Every turn is a potential postcard memory, every vista a magnificent sight. Marvel at the jagged, snowcapped peaks looming before you. Be amazed at the dense pine woods, the emerald mountain lakes and abundant wildlife all around you. It’s not a short drive to Panorama, but it’s a beautiful one. And once you arrive, park your car for the week and forget about it. This resort offers ski in and ski out access, meaning you can ski right up to your accommodations, a luxury that means true relaxation after an exhilarating day on the slopes. And at Panorama, they’ve got 4,000 vertical feet of fall line skiing in the pristine Purcell Mountains, with 3,000 acres of terrain ranging from backcountry powder bowls, to corduroy cruisers, to family friendly zones. As our neighbor to the north, some may overlook Canada as a vacation destination. For those who like to travel internationally, it may seem too close to home. For those who prefer to hop in the car and be in their vacation destination in just a couple of hours, Canada may seem just out of reach. 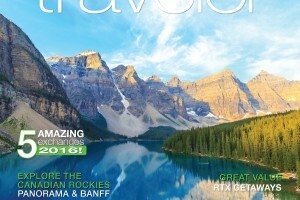 In this issue of RTX Traveler Magazine, we have found many reasons to put your assumptions and preconceived notions aside, change your U.S. dollars for some loonies and toonies, don your toque, grab a double double and head north.